So on our “camping” trip to Portland we ate a place that I found on Chowhound. It had lots of positive comments and it was only about 3 blocks from our hotel, um I mean campsite. I wont go into a review of the restaurant as I will have that up on my other blog in about a month. Other blog? Yep, crazy Peabody will have yet another food blog starting June 1st. Now I will give you many more details in an upcoming post(I’m having a giveaway) but it is called Northwest Noshings. It is all things Northwest food. From restaurant reviews to Northwest cooking…and there will be no baking on it. Enough of that for now. So the restaurant specializes in comfort food and the minute I saw the menu I spied the word Key Lime Pie and was a happy girl. For key lime(as long time readers know) is one of my all time favorites. It was completely old school, graham cracker crust with tangy key lime filling and whipped cream pilled sky high. It was heavenly. I craved it the rest of the weekend. That craving never went away and so I decided the best thing to do would be to make it. I needed to see if the bad ju-ju was gone anyway. Whisk sweetened condensed milk with the egg yolks. Whisk in Mascarpone cheese. Stir in whipping cream and lime juice. Stir in 1 to 1 1/2 teaspoons lime zest. Pour into a prepared graham cracker crust and bake at 325° for 15 to 20 minutes. In a food processor, blend together graham cracker crumbs, coconut, sugar and pecans. You want to make sure that none of the coconut is visible. Add about 7 TBSP melted butter. Pulse a few times. If it seems like it needs more butter add the remaining TBSP. Pour contents into a pie pan and press to form a shell. I used 4 mini pie shells. Bake crust for 10 minutes at 400F. If you are using the mini pie pans, prebaking is not necessary. I served my pie with whipped cream, a little leftover lime zest and plated with some of Fran’s Raspberry Sauce. While cherries are my all-time favorite of the fruits, I must admit my favorite pie of all time is key lime (thanks to my mother: we used to sneak out by ourselves once a month, and have a slice of key lime pie at our favorite diner in town). Beautiful pie, Pea. Glad the curse is gone! i love key lime! coconut-pecan crust sounds most excellent. looking forward to your other blog…i’m always looking for places to check out when i visit my parents (who live in the seattle area as well)! OMG, that pie looks extremely delicious! I love citrusy desserts… With the mascarpone and the coconut-pecan crust, it must taste heavenly! I love the idea of the coconut-pecan crust, that sounds just delicious! Glad that you got your ju-ju back! Sounds lovely! I like the addition of coconut too. We also went camping this past weekend to Key Largo and had some key lime pie. of course right? well, it was terrible! i should have brought my own! Oh my goodness! You have taken pictures of HEAVEN! 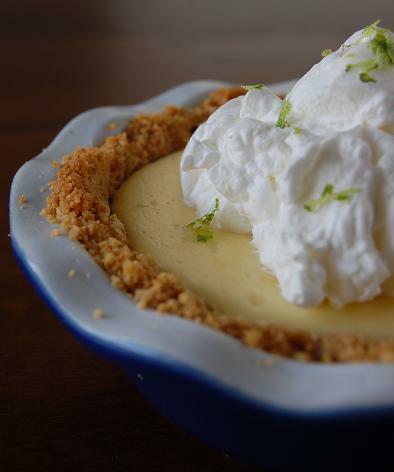 Ahhhh… key lime pie is seriously a freaking GIFT. And yours looks amazing, as always. YUM! Welcome back from your trip!! 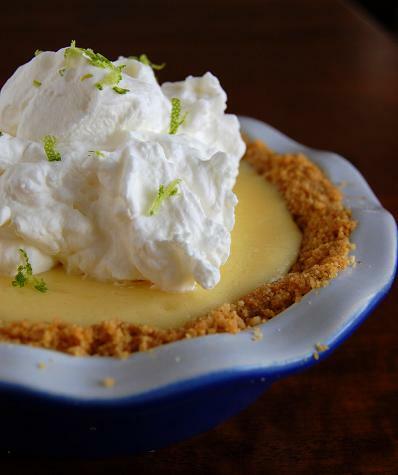 How wonderful that you found Key Lime Pie on the menu at Northwest Noshings!! Key lime pie is one of my favorites, yet I rarely have it, go figure! Your version looks like it has an almost cheesecake-like texture, it looks delicious! Um, can I come camping with you? 😉 This key lime pie looks delicious…I love them thick and tangy! I can’t wait to read your new blog, especially as I have a business trip coming up in the area and will need good suggestions where to go to eat. And this pie looks so summer! I love key lime and this really makes me want to make something tart today. Yum! Oh, and another blog? That is wonderful! that is a gorgeous slice of key lime! the mascarpone makes it so fluffy looking. glad to hear your er, camping, trip went well! I’ve never had key lime anything! I really must get on that! Looking forward to seeing your new site! These are beautiful! And I can’t wait for the new site since we are going to be moving to that area. Keep us posted. That’s my kind of camping! I hope you didn’t get too many bug bites. The pie looks delicious. Way better than the camping food my parents used to rehydrate over a Coleman stove. Key lime pie is my absolute favorite and my dad’s, too. In fact I might steal this and make it for him this weekend when we visit. I think I need to adopt your style of camping… The pie looks great! Coincidence! 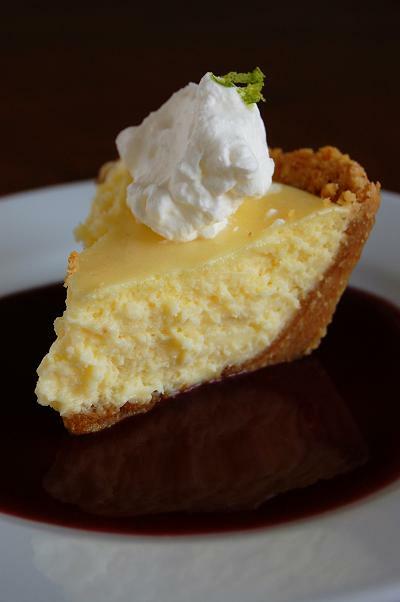 I was just thinking about key lime pie yesterday b/c I saw them at the grocery store (I guess we do have a few nifty things available here in FL), and we just booked a hotel in Key West for memorial day weekend. I’m going to find out where to get the best pie down there…I’ve never been. But now, I think I should just make one myself in anticipation of the trip. I’m a huge key lime fan too. Your version looks fabulous and I love your additions to the crust! I’m glad your ju-ju is finally gone! From a fellow key lime lover, this sounds deliciuos! And I can’t wait to see your new blog – I’ve always wondered what kinds of foods get cooked in your kitchen! Peabody…if you baked this in a single pie plate, would you use a 9 inch? and would you adjust the baking times? I’ve made key lime pie many times but never with mascarpone and whipping cream, but this sounds heavenly which is why I am wondering about increasing the baking time. Thanks! I have been a Key Lime Pie addict since I moved to the US, can’t get enough!! This one would totally make the camping trip worthwhile!! Good luck with the new site, I am excited to check the area through your writing for when I (hopefully) make it that way one day! I love the way you go camping! And I’m a sucker for a good key lime pie, too. Your pie looks luscious, as always. I’d love to try an actual key lime pie, I make lime pie and love it, but sometimes I wonder what the real key limes are like, yum! yum! I love key lime pie! Will have to try this! Oh my GAWD! Another wonderful Key Lime Pie recipe to add to my collection. The BEST dessert on the planet . . . Key Lime Pie. By the way, Trader Joe’s (if one is in your area) has a small mesh bag of key limes for a very reasonable price. My wife and I will be trying you method this weekend. Thanks! Your pie looks amazing! You are such a wonderful chef and photographer. It seems photographing food is just as hard as baking the food. I think you have me beat. My camping staples are usually hot dogs, smores and beer. I mix it up with some foil pockets of grilled veggies and grilled filet now and again because I can’t entirely let go of my high-maintenance self even in the wilderness. Good luck with your new blog; I’m sure it will be another success. Anything lime is a hit with me. They look so delicious. I’m looking forward to reading your new blog, too, since I grew up in the Seattle area and lived in Portland for several years. I’m a Pacific Northwest gal and always will be! This is so fitting. A spot my coworkers and I frequent on Thursdays for Happy Hour has a To Die For Martini called “Key Lime Pie” and it is what I imagine this pie would taste like pureed in a blender. I am adding this to my “to make” list immediately. yum. fitting for me right now cause i just made an amazing key lime cheesecake with coconut crust. the flavor of key limes, creamy mascarpone and i used greek yogurt as well was heavenly! oh, i love me some key lime pie! this recipe looks great and i will have to try it. have you ever had frozen key lime pie? i fell in love with it at the “lime inn” a fabulous little restaurant on the island of st. john in the usvi (where we were married!). i’ve almost got it replicated, and it’s very similar to this 🙂 try it frozen! so yummy! oooh…yum! This looks yummy! Glad you got your juju back! I’ve never liked key lime pie but it is my dad’s favorite ever…I think I’ll send this to him to tempt him and make it for him…It looks beautiful! but your cake! girl your cake looks amazing!! glad i found you! Peabody – sometimes i think we were separated at birth… our mothers’ sound similar, i’m a huge hockey fan and now it has been revealed that key lime pie makes your heart sing, as it does to mine. well, maybe not separated at birth, but at least i can pretend 🙂 i can’t wait to try this recipe out! Hi Peabody-I just found your blog, and I love all of the fabulous things you make! It looks like we are neighbors…I live in Mill Creek. I look forward to your new blog, my husband and I are always looking for fun new places to try. Shhhhhhh…… I’m about to make this pie right NOW while my husband is at his Pilates class. He’s been depressed lately and I know this will cheer him up — key lime pie is one of his favorite things (and one of the only things he can still eat). Pea, I’d love having this for breakfast, lunch and dinner too. It looks and sounds heavenly. I’m a sucker for limes. Breakfast lunch snack and dinner – now that sounds like a class A++ plan to me! There’d be no chance of it getting stale that way. Looks beautiful Peabody! Oh man, this would make a wonderful breakfast! I won’t be able to look at my eggs tomorrow morning without thinking this would be so much better to delve into! This looks like the perfect Key Lime Pie! My fiance has been requesting Key Lime Pie but I’ve put it off because I didn’t know which recipe to use. I’ll definitely keep this one in mind! It’s time for me to bake~this is right up my alley…love the crust ingredients! Can’t wait to read your new blog, being an ole Seattlelite! the pie looks amazing … just what i need now after my lunch. Breakfast? Oh my, I’m packing my toothbrush now. that crust sounds AMAZING! and i loooove key limes. looks delish!! when i saw the first photo i thought to myself… “mmmmm… some key lime pie to go w/that whipped cream” 🙂 nothing wrong with a huge dollop of whipped cream, esp when it is homemade. so..i’m allergic to coconut, but I REALLY want to make this. I was just going to make a basic graham cracker crust, but I think it might be too boring for it. any suggestions that do not involve coconut? Yay – I can’t wait for your new blog! Lucky me, for living in your town! Okay, I made this pie and it was amazing. The crust was delicious, almost better than the pie, Just like most of the other’s…Key Lime is my fav. I made your pie and it was great! with changes on which ingredient comes first – really important!